Prince Ashini must choose between the love of the beautiful goddess, Sekra, and duty to his own people. 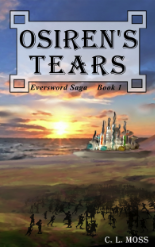 Osiren’s Tears is now up on Amazon. It is priced at $2.99 at the moment. I might put it up on sale this weekend for 99 cents. I still have to figure out about marketing before I do that. However, I am going to be moving this to $4.99 next month. It’s a full length book, after all. There is a sample available on Amazon. You can read most of the first chapter there. Try it before you buy it.